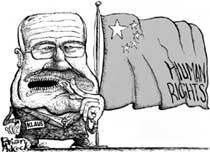 Petr Kutilek, Executive Secretary of Olympic Watch, has published an article in the Prague Post, arguing that Czech President Klaus has the obligation to thoroughly discuss Beijing’s human rights abuses during his trip to China. The piece, titled "Choices in Beijing", refuses the typical cultural relativism approach that Klaus and some other Western politicians adopt when dealing with China. The democratic determination of people in Hong Kong and Taiwan, as well as of dissidents in the PRC, shows that those Chinese who can or dare to speak their mind freely, understand very well the concepts of human rights and democracy. The full text of the article as published by the Prague Post is available here. Cartoon republished courtesy The Prague Post.